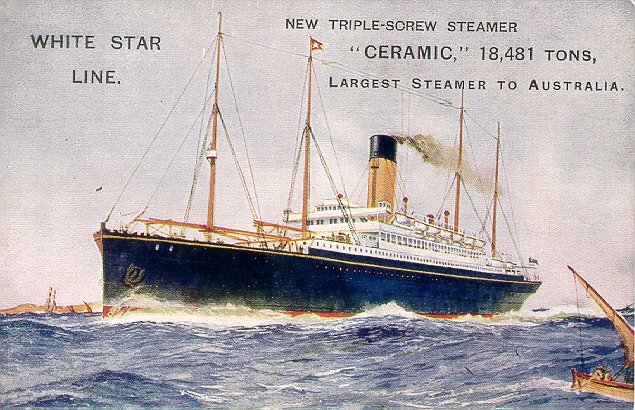 One of a relatively small number of merchant ships to see military action in both World Wars, Ceramic was built for White Star by Harland & Wolff, Belfast, and launched in 1912. She was White Star's first "all cabin class" ship and also had two permanent 4.7 inch guns mounted aft. 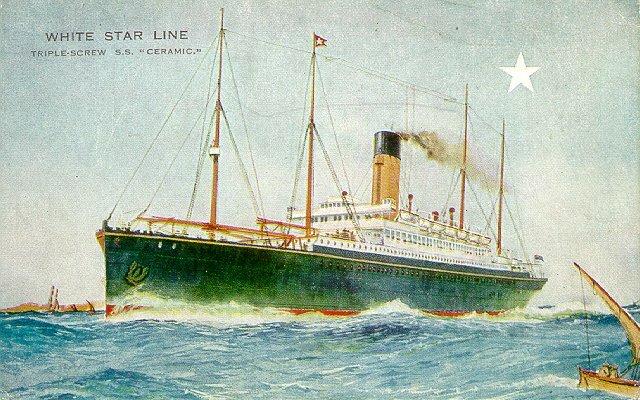 Ceramic made her maiden voyage in White Star's Liverpool-Australia service on 24 July 1913, after representing White Star at the Mersey Pageant earlier that month. 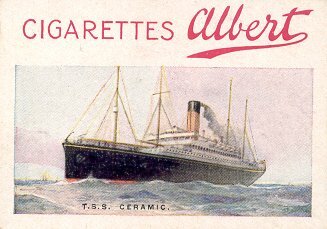 Ceramic was, at the time, the largest ship to serve Australia, as well as the largest to call regularly at Capetown. Ceramic was taken over for trooping from August 1914 until May 1917. After that she was operated (mainly as a freighter) by the Shipping Controller under the Liner Requisition Scheme. 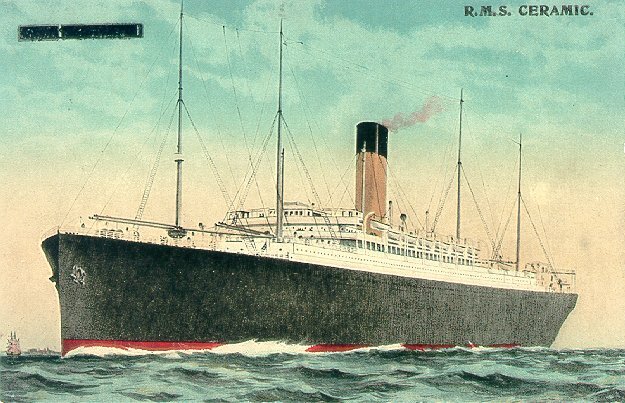 At war's end she was refurbished by Harland & Wolff and resumed service to Australia from Liverpool (with an occasional call at Glasgow) in November 1920. 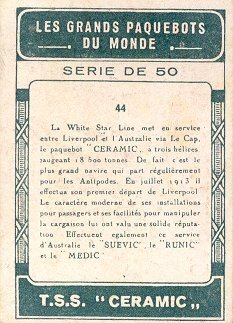 When White Star was absorbed into Cunard White Star in 1934, Ceramic and the Australia service were transferred to Shaw, Savill & Albion, a former White Star subsidiary. The ship was again modernized at Harland & Wolff in 1936, and remained in Shaw, Savill service until she was requisitioned as a trooper in 1940. During the night of 6-7 December 1942, Ceramic was torpedoed by U515 off the Azores. Only one of the 656 on board survived. He was captured and taken to a POW camp in Germany. Some sources contain statements to the effect that Ceramic's loss was "unrecorded for many months" (Haws) or the Admiralty did not know when and where she sank "until much later" (Kludas). Such statements are not accurate. German claims to have sunk Ceramic off the Azores appeared in the press within two days after the event. Sources: Haws' Merchant Fleets; Williams' Wartime Disasters at Sea; Kludas' Great Passenger Ships of the World; The New York Times, 9 December 1942.